1. It has been wisely said that we cannot really love anybody at whom we never laugh. 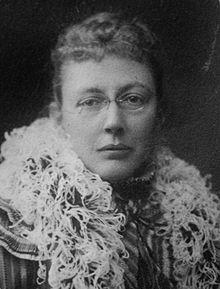 Excerpt from Wikipedia: Agnes Repplier (April 1, 1855–November 15, 1950) was an American essayist born in Philadelphia, Pennsylvania. Her essays are esteemed for their scholarship and wit. 1. Democracy forever teases us with the contrast between its ideals and its realities, between its heroic possibilities and its sorry achievements. 2. Humor brings insight and tolerance. Irony brings a deeper and less friendly understanding. 3. It is as impossible to withhold education from the receptive mind, as it is impossible to force it upon the unreasoning. 4. It is impossible for a lover of cats to banish these alert, gentle, and discriminating friends, who give us just enough of their regard and complaisance to make us hunger for more. 5. There are few nudities so objectionable as the naked truth. 6. It is not easy to find happiness in ourselves, and it is not possible to find it elsewhere.